“O Romeo, Romeo!—wherefore art thou Romeo?” – An excerpt from William Shakespeare’s play – Romeo and Juliet. 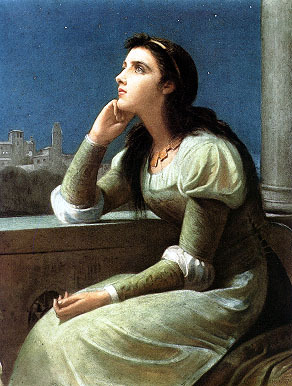 Juliet Capulet – During the Elizabethan era, girls weren’t allowed to become actors in theatres and majority of characters like “Desdemona”, “Lady Macbeth” and “Juliet” were actually played by men. Shakespeare’s tragic romantic play “Romeo and Juliet became an instant success overnight. The lead characters in the play are considered equally powerful as “Hamlet”, “Othello” and “Macbeth”. Juliet Capulet is the female protagonist of the tragic play who unknowingly falls in love with Romeo only to realize later that her lover belongs to the rival family. On one side Juliet can’t bear the separation of her lover and on other side she has to abide by the rules laid by her family. Though Romeo and Juliet get married secretly, their hopes of living together are short-lived. A scuffle between Romeo and Tybalt, the Juliet’s cousin takes place where Tybalt is killed by Romeo. What happens next is series of tragic events that tears apart the lovers and brings an end to the eternal love. Actresses who portrayed Juliet – The role of Juliet Capulet was played by Olivia Hussey in the 1968 movie – Romeo and Juliet while Claire Danes portrayed the modern Juliet in the 1996 movie adaptation, directed by Bazz Luhrmann. The new adaptation on Romeo and Juliet featured hailee steinfield as Juliet in the 2013 movie. If you want to know more about Juliet in detail, then you should definitely read this tragic masterpiece – Romeo and Juliet where every line written by Shakespeare is a priceless gem in the world of literature. Good one!! Thanks for sharing.